Perfect quick and delicious weekday meal. 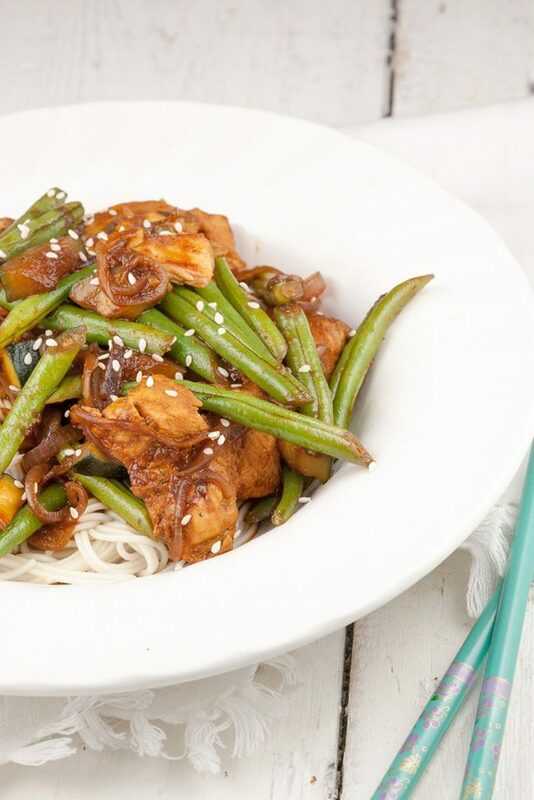 Chicken and green bean stir-fry with a quick soy sauce, zucchini and mushrooms. Ready in 20 minutes, recipe for 4. REMOVE the ends of the green beans and slice them into half. RINSE the zucchini and chop into pieces. CLEAN the mushrooms with a paper kitchen towel or mushrooms brush and chop them into slices. PEEL the red onion and garlic cloves and finely chop the garlic cloves and chop the onion into half rings. Make a quick sauce by combining the soy sauce, sambal, sesame oil, smoked paprika and season with pepper and salt. Use a whisk to create a smooth sauce. 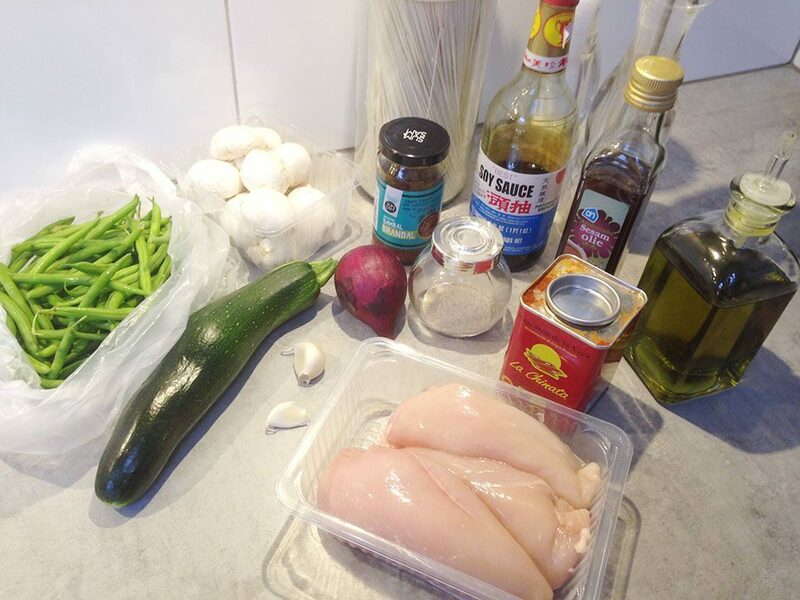 REMOVE any excess fat or muscles from the chicken fillet and chop them into bite-size pieces. Most noodle types only need to soak in boiled water, so get the boiling water ready. You can also use a water kettle for this. POUR the boiled water over the noodles, cover with cling film and soak them for a few minutes. The time depends on the type of noodles you’re using, according to the package. DRAIN the noodles using a colander or sieve. HEAT the wok on high-heat and when it start to smoke ADD some olive oil and fry the chicken pieces. ADD the green beans and after about a minute, also ADD the zucchini, mushroom slices, garlic and red onion. 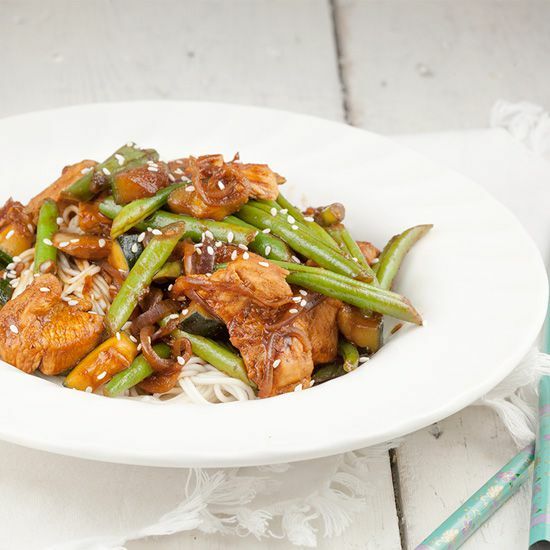 Stir-fry for a few minutes on high-heat until the veggies are soft enough and the chicken is fully cooked. ADD the sauce and season the stir fry with pepper and salt if needed. 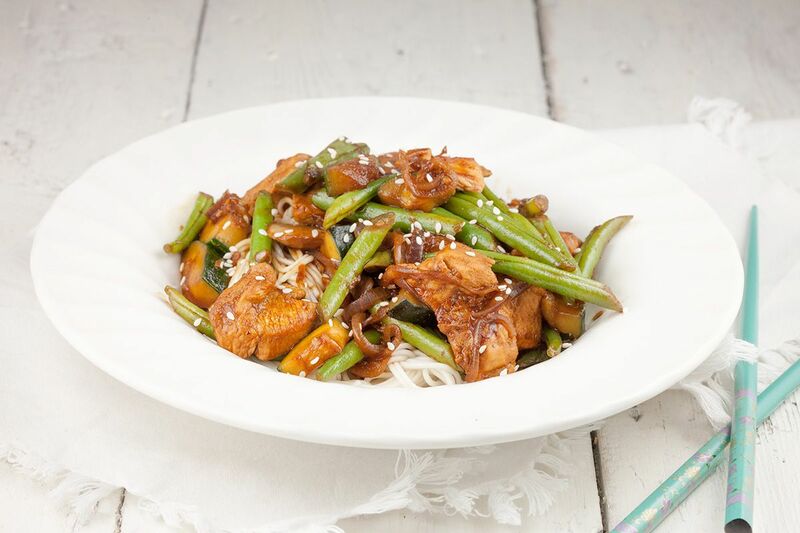 SERVE the chicken and veggies with the drained noodles, finish them off with sesame seeds and enjoy!